One of my many pet peeves about Delta.com is that when you go HERE to look at your current list of upcoming flights (you must be logged in to Delta.com), and you have a schedule change, you will not see it. As you can see from my list of upcoming flights with Delta, I would not have known about any flight or seat changes or problems unless I click on each and every one. This is MOST frustrating. This was one of the GREATEST things about AwardWallet, that is before Delta blocked them. AwardWallet would via email each day alert you to ANY changes like your seat or time or such. Now we must check for ourselves or wait to hope the Delta “IT” does send out a notice e-mail that your flight has changed. Truly this is unacceptable! Let’s hit these one by one. 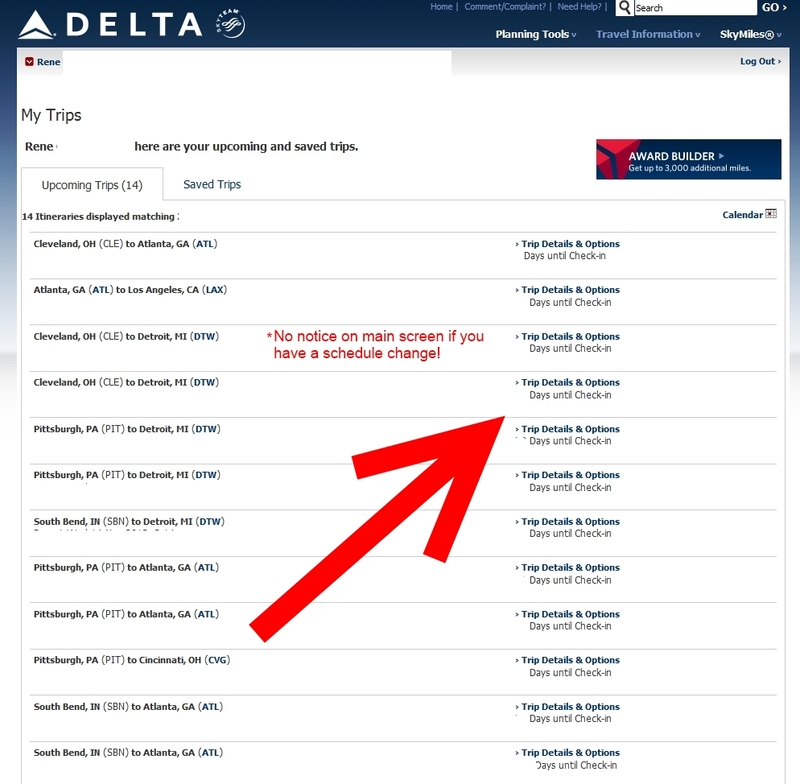 1) Delta schedules change all the time. Logic dictates that the farther out you can book the more likely you are to have a change and thus the reason to book as far out as you can stand. This is a bus. One of the only real changes seasonally is that summer is often an A330-300 and winter the smaller A330-200. This flight almost never changes. If it does change, it is a few minutes here and there. However, regionals change all the time and the changes can be dramatic like 1 or 2 or even 3 hours. This takes us to the next point! So if more than 1 hour departure or landing and you are GOLDEN! Also keep in mind the total it is cumulative. That is, say from your ORIGINAL booking you have two 30+ min changes, you are now up to the 1 hour rule! But there is more to it that just this. For a domestic connection, you must have 30 min to make your flight. If you are in a wheelchair it is 60 min to make your flight. If it is “close” to this time most phone reps, when you explain to them that say 33 min to make a connection in ATL is never going to work, will work with you to change it at no charge! Also, internationally you need a 60 min connection to clear customs. Same thing, you can explain 63 min is in no way enough time to both wait for your luggage, wait in line at customs and make your connection flight! So use this to get the change you want! Hello (insert reps name). I have had a schedule change to my itinerary # (insert number) and it will not work for me. Could I please change the flights on (insert date) to DLxxxx and connection to Dlxxxx? And you should be good to go. If they say things like, “I can not do that” or “this is outside the rules” or “you do not meet the min. time for a free change”, say, “OK I will leave it as is” and call back and try another rep. Or, ask for a supervisor to allow the change with the info above. Or, ask for the international reissue desk (when you are travailing internationally) as they often understand what will and will not work and can do it for you. 5) This is the one you must understand clearly. There is the slight chance you can get stuck with the crazy flights and seats you have picked (I am 100% successful to date but I always load up with regional fights) . While I am most upset by the current state of the ETV bump voucher rules, with a ton of connections you can have many chances for “bumpertunities” that is, to give up your seat for “delta dollars” giving you credit toward a later flight and then they can put you on much more direct flights! PS – As a follow-up see THIS POST also for more great info about schedule changes! Thanks for posting this Rene! I took advantage of the schedule change rule for the first time a few weeks ago: I had my partner book a crazy international itinerary with three very tight US connections (it cost hundreds of dollars less than the more direct routing, taking advantage of the cheap SVO fares a few months back). A few weeks ago her flight MSY-MEM schedule changed, making that connection impossible, and Delta was happy to put her onto the more direct, much more expensive route she wanted in the first place! Hi Rene, great post – thanks for shedding more light on this very important subject. I’m understanding the “theory” but still lacking on the execution/practicality. Quick question. I have an international reservation that I made on DL because it was on a plane with the new lay flat beds. Planes changed and it is no longer lay flat. 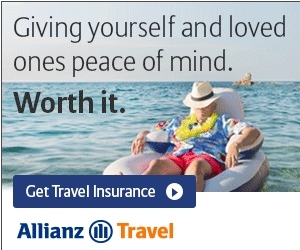 any chance I can use that as an excuse to change flight for free? Does it make sense for a SLC flyer to Europe who wants a good business seat to avoid the above techniques as the only non-stop DL flight from SLC to Europe is on a 763 with old recliner-style seats? @M – no. You can book regional flights from SLC to LAX or many other locations right? And from their on to say DTW or ATL or other places. You can still load up with connections if you want and then can pick what you want if the change happens. The timing of this post is uncanny. As a Delta Silver, I was able to tweet and request a change b/c my flight schedule was altered by more than 4 hours. Originally arriving on Black Friday at 5:20 in OKC was changed to 11:23 arrival….and my final destination is 100 miles away in Tulsa. INSTEAD, now I am flying in and out of Tulsa with better itineraries! Thanks Rene…I hope others can benefit from the wonderful service you provide! Thanks you for posting!If my schedule is changed over an hour, can I request a refund and cancel the trip? This is interesting. I always get an email alert if there is a change to my flights. Award and paid. I’ve also “complained” a few times…okay more than a few times. Every time but once I’ve asked for miles (usually 10K, 25K once) and got them, and changed my flight at no cost. I’m just Gold too..
@Pablo – yes! Or change it free. I booked low level award seats on Delta via Alaska. My schedule changed by more than an hour and I’m not real thrilled. If I want to change the flights, do I have to find low level seats? Or will Delta play nice and change me to any flight that has award seats available? @Deborah – not 100% sure but confident if you find the flights you want and tweet or call space should not matter. Thanks. I took a chance and actually got my tickets changed! I had to call Alaska since I used their miles. After a long time on hold, they came through and changed the ticket. I originally booked 2 25K award seats. Only thing available now is 60K award seats but they changed me anyway! Yeah Delta!!! I set up an alert on Yapta for all of my flights after I book them. Once a week, I get an email alert that shows me the price status for each flight I have booked. But, more importantly, if there has been a schedule change on one of my flights, it shows up as “unable to review price”. That’s my flag to go to the airline’s website to find out what has changed. Thanks for the tip re: accumulated time on multiple changes. I didn’t know that. Is it applicable to all airlines, or just Delta? I booked a MR. LGA AUS PHX DTW JFK. There is a schedule change. Do you think I can increase the value of the MR by changing DTW to SFO? The new itin would be LGA AUS PHX ATL SFO JFK. @VC – you can not change start or end but add legs in middle or longer routes if space open. Rene: This post has very good information, thanks. Just to clarify – if my outbound (1 stop) has a 2 hr. schedule change, I can’t use the ‘free’ change to change the return to a better (DL metal) routing? Currently my return has 4 stops and I am trying to find a better routing. @MSPpete – correct. One direction only. Your return would have to have a change (and may still happen) for you to change that direction. I have a flight from MCO to GRR (connecting in DTW) that had a schedule change (it was only a 15 minute change from MCO to DTW). There are two segments to the flight. What do you think the chances are that I could get that first segment switched to a flight leaving at 4:00pm instead of the original flight at 6:15pm? This was booked on an award ticket. I know this is a bit of a stretch, but I would love your advice. This other flight has much better availability for a first class upgrade. @Jason – I would try tweeting the flights you want to @DeltaAssist and see what happens. I have the script on the @DeltaAssist post. @Rene – You are loved. Delta Assist is so fast. That’s the third time I’ve used them with success. You are appreciated. One other thought… I’ve noticed that Delta, in general, is much more picky about adjusting schedule changes for award flights vs. paid flights. When I spoke on the phone with a rep about a previous schedule change that was +1 hour on an award flight, she kept bringing up that it would cost more miles on an alternate flight, and she was really opposed to changing any flights that weren’t involved in that one specific segment schedule change. In some of your other posts, it seemed like if there was one schedule change of +1 hour, all segments could be changed, and there would not be a mileage increase on an award flight since there was a +1 hour schedule change. I would like to know your experiences before I start booking my award flights for next year (I usually fly paid, not award, but I need to start using up some of these miles). I was on the NRT-SIN direct for an outbound of a rt ticket that only has one flight per day. The schedule change is going to make me miss that leg. Can I do either of the following: change the departure date to a later date (2 day stop in Tokyo wouldnt be bad) or change the destination to Bangkok which is ultimately where I was going to after SIN? I was able to change the destination from DTW to DCA once on a schedule change but wasn’t sure if this was different for international. @Matt – yes if change is big enough or connections will not work. Hi there. I am looking to try and cancel my flight with Delta. I have a non-refundable ticket but my itinerary has changed at least twice. I have a connection and the connecting city changed completely (Pittsburgh-Detroit). I called and the rep told me they did that in order to help the lay over be shorter but I really want to get out of the ticket. Is there anything I can do? @Ari – only if departure or arrival has changed 1hr or more. If just the connection, no, unless it is less than 30 min. Thanks again for this post. I just used the information to switch to a preferred flight when there was a 63 minute change to my schedule.